Opening reception Saturday, November 14, 7:00 – 9:00 p.m.
Members and artists only, 6:00 – 7:00 p.m. Photographer Peter C. Cook and artist Howard Siskowitz have combined their talents in a unique collaboration by simultaneously creating portrait drawings and photographs of several Princeton and Trenton residents. Peter C. Cook’s photographs have been on exhibit throughout New Jersey. 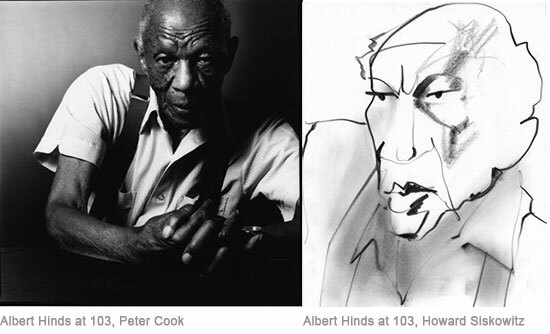 He is the recipient of the Elizabeth Shuman Humanitarian Award for Black & White Portraiture (2006) and the Performing Arts & Artists Award for Black & White Photography (“Jazz Sets” 2006). Howard Siskowitz’s 1984 commissioned works for the National Aeronautics and Space Administration are included in the Smithsonian Air and Space Museum permanent collection. His work is shown widely and is included in many public and private collections.